The R-3 was a project for a long-range ballistic missile. The development of the project of a missile with a range of 3,000 km was initiated by the Decree of the USSR Council of Ministers on April 14, 1947 at NII-88 under the general supervision of S.P.Korolev. The R-3 project was in direct competition with the design to the same specification of the captured Germans (Groettrup's G-4). The design of the missile consisted of three sections: the R-3 rocket (Department No. 3 of SP Korolev Research Institute-88), the propulsion unit (OKB-456 VP Glushko, on a competitive basis with the NII-1 MAP under the leadership of A.Polyarnoy) and control and control systems (the main designers are N.A.Pilyugin and M.S.Ryazansky). In 1949, in the interests of developing the rocket, research was carried out on the topics "Investigation of the operating conditions of long-range missiles, their aggregates and equipment in flight" and "Research of long-range missile design principles and methods". The draft version of the R-3BN missile was completed in June 1949. In November-December 1949, the project was discussed at specialized sections of the scientific and technical council of NII-88 and on December 7, 1949, the draft design was approved by the Scientific Research Institute -88. NTS recommended the creation of an experimental rocket-model P-3A for testing technical solutions of the P-3 project. The design of the R-3A missile was flown, flight tests were scheduled for October 1951. The design was discontinued in connection with the start of the design of the R-5 missile in 1950-1951. One of the rocket research institutes of the Academy of Artillery Sciences was the so-called Tikhonravov group. This group united young engineers who dealt with the problems of the newly born astronautics. The Institute was founded in 1946, with General Alexei Ivanovich Nesterenko as the director of the institute. The department headed by Mikhail Klavdievich Tikhonravov developed the problems of liquid ballistic missiles, it consisted of several departments: the design department of rockets, two departments dealing with research of engine and fuel problems, and another department - ballistic, which specialized in developing problems associated with the theory of flight of liquid ballistic missiles. He was a well-known rocket scientist. According to his design, the first liquid rocket "09" was created in the Soviet Union, successfully tested on August 17, 1933 at the test site in Nakhabino near Moscow. The task of launching a spacecraft with a person on board into the orbit of an artificial Earth satellite could only be solved with the use of a multistage liquid ballistic missile capable. 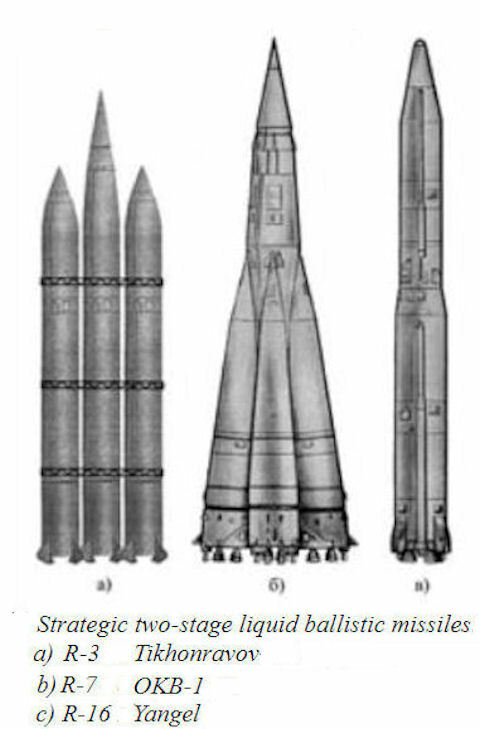 Tikhonravov, based on the little-known works of KE Tsiolkovsky, proposed a very fruitful idea of creating such a rocket on the basis of the then existing technical level of Soviet rocket engineering. This idea consisted in the transition to a new, unconventional way of assembling a composite missile under the so-called "package" scheme. The idea was not new. At one time, Tsiolkovsky proved that by taking a large number of single-stage rockets (they must be connected by flexible pipes to transfer fuel from one rocket to another) and having launched all the missiles simultaneously, one can achieve an unlimitedly large speed. In flight, as the fuel was used up, it was necessary to refuel a part of the missiles at the expense of others, and to separate the latter. The remaining "in the ranks" get the opportunity to increase the speed. The last of the remaining missiles would reach an arbitrarily high speed - depending on the number of missiles involved in the launch. To implement the idea in the form described by Tsiolkovsky is practically impossible. Preliminary results were reported by Tikhonravov in 1948 at the institute's NTU, where the idea of a "package" scheme was in fact rejected by the institute's scientists (a ban was put on research on this topic), and a report was made at the first scientific and technical conference of NII-4 in March 1950 of the year. As it usually happened in the Soviet Union, repression followed. M.K.Tikhonravov was removed from the post of the head of the department, he was left only as a consultant of the department. An "underground corporation" actually formed in the department, whose members (later members of the "Tikhonravov group") continued to work on their planned research work forbidden subjects. Developments of the problems of multi-stage missiles of the "packet" scheme, designed in the form of scientific reports, were sent to the Design Bureau of SP Korolev at the beginning of 1951. The possibility of achieving the first space velocity was shown for a two-stage "package" of three R-3 missiles (design parameters for the development of the RS Korolev Design Bureau for the R-3 missile with a range of 3,000 km). The possibilities of creating multi-stage liquid ballistic missiles of long-range action, initiated by Tikhonravov on the basis of a "package" scheme, were very useful! Sergei Pavlovich ordered the institute to do research work to determine the possibility of creating an intercontinental liquid ballistic missile "packet" scheme. The theoretical development of composite missiles of the sequential circuit (the first stage is working out its resource and is discarded, the second stage is being activated, working also until the fuel is exhausted, then the next, etc.) showed a number of fundamental difficulties that were not only purely technical, but also related to the development of new technologies, new technical equipment and new service principles under particularly unfavorable conditions to ensure the required reliability. According to Tikhonravov, a reliable two-stage intercontinental ballistic missile of the "sequential scheme" in the early 1950s was impossible to build. And it was decided to use the "package" scheme. By the early 1950s, development of intercontinental ballistic missiles was being carried out by the Soviets in three directions. The first in the OKB Korolyov, based on the proposal of M.K.Tikhonravov, to create an intercontinental missile of the packet scheme of three single R-3 missiles designed by the Design Bureau; the second in the OKB Korolyov to create an intercontinental ballistic missile of an optimized package scheme with various component components; the third in the Yanghel Design Bureau to create an intercontinental two-stage ballistic missile of the tandem scheme. However, the first direction was limited only to the developments that were being carried out at NII-4, and in the OKB Korolyov it was impossible to realize the creation of an intercontinental missile from three R-3 missiles, since it was impossible at that time to create an engine for the P-3 with the required characteristics.